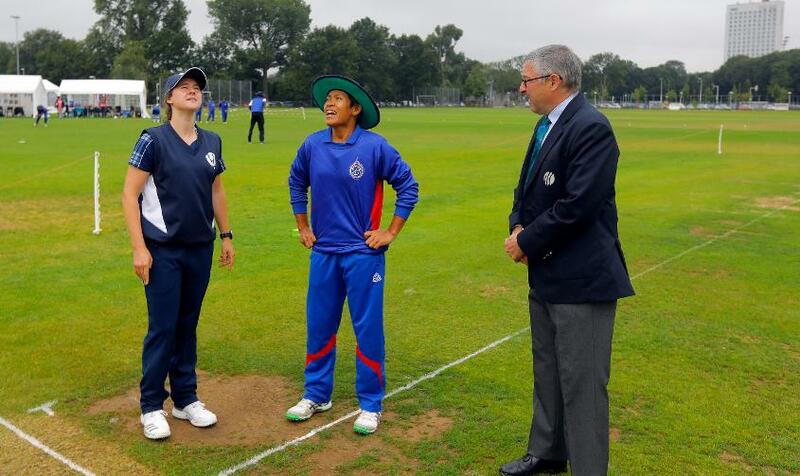 Scotland secured a 27-run victory and semi-final progression, while Thailand crashed out on the third match day of the Women's World T20 Qualifier. 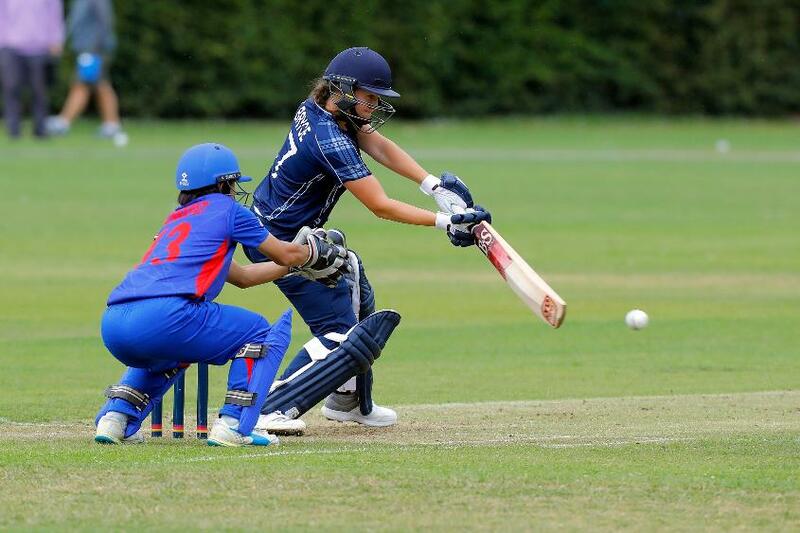 Kathryn Bryce's excellent 39 from 42 deliveries guided Scotland to 97/7, before Rachel Scholes' magnificent 4/10 helped their side dismiss Thailand for 70, ensuring Scotland's progression to the semi-finals and Thailand's elimination. Scotland entered the game knowing a win would guarantee them a place in the semi-finals, while Thailand, on the back of consecutive losses, required a victory and for other results to swing in their favour for them to progress. The Black Cats won the toss and elected to bat, and Thailand made early inroads, Nattaya Boochatham dismissing both openers, Sarah Bryce (5) and Lorna Jack (6) both falling for single figures scores. At 14/2 inside six overs, favourites Scotland were on the back foot. Ratanaporn Padunglerd (1/23) chipped in with another to peg their opponents back to 24/3, taking the wicket of Scholes for just 6 after some impressive, economical Thailand bowling had kept the run-rate down to 2.66. Chanida Sutthiruang was impressive, notching figures of 0/9 from her four overs, while Sornnarin Tippoch (0/19), the brilliant Boochatham (3/16) and Suleeporn Laomi (0/13) all bowled tight spells. Scotland were left somewhat stranded, needing an injection of runs, and it was up to Bryce and Becky Glen to rebuild. The latter eventually holed out for 28 after smashing four fours, caught on the boundary as Lienprasert (1/13) picked up her solitary wicket. Skipper Bryce was unbeatable though, and she helped Scotland reach a total of 97/7, having dragged her side from a poor position to a competitive one with an excellent unbeaten 39 from 42 deliveries. In reply, Thailand were equally stunted in their attempts to build a good platform from the top of the order. After an excellent run out from McGill to dismiss Naruemol Chaiwai for four, Rachel Scholes ripped through the Thailand batting line-up. Boonchathham (4) was her first victim before Tippoch was cleaned up first ball, and they had slumped to 11/3 after four overs. Opening batter Nattakan Chantam (16) showed some valiant resistance, but once again Scholes prevailed, putting an end to an entertaining innings that yielded the game’s only six. Bryce was dangerous with the ball (1/14), while Priyanaz Chatterji (1/16), McGill (2/4) and Abtaha Maqsood (1/7) all picked up wickets as Scotland honed in on victory. Nannapat Koncharoenkai’s mature effort of 22 from 34 helped kept slim chances of a Thailand fightback, before Scholes proved too potent again, cleaning her up and ending with phenomenal figures of 4/10. The remainder of the Thailand team failed to reach double figures, and they were bowled out for 70, becoming the first chasing side to lose in this tournament so far. A 27-run victory guaranteed Scotland’s place in the semi-finals, while Thailand’s run in the WT20 Qualifiers came to an end following their defeat.